120 Days Same as Cash $936.00- We are just a Call Away. Enjoy the comfortable design of this contemporary Zella Charcoal sectional by Ashley. 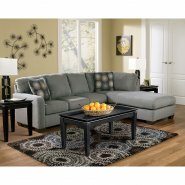 It has plush cushions and soft upholstery and creates a sleek style with it track arms and soft gray upholstery. With its long chaise that can be ordered for either side, this sectional creates an inviting atmosphere in any home.